The day I shuffle off the mortal coil, I may be remembered for a number of things, but my green thumb will not be one of them. You see, I am a known plant killer; coming second only to Isopropylamine Salt of Glyphosate (my rival, Roundup). But please don't get me wrong. I am not a malicious person: I love plants. 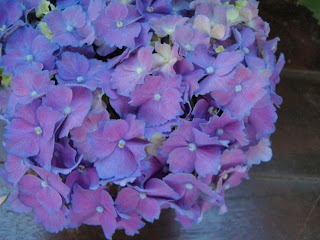 For example, I dote on the beautiful hydrangea bushes dotted around our garden. They were established plants when we moved in and I have tried very hard not to cut their lives short. I have learnt how to prune and nourish them in winter and protect them in our harsh summers. Every now and then I try and do a little reading to learn more. 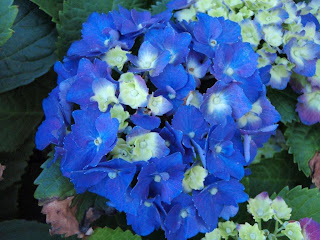 This week, I discovered that hydrangeas need aluminum in the soil to produce blue pigment. But importantly, in order to take up the aluminium, they also need the soil to be acidic. 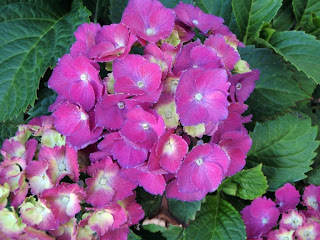 If the soil is too alkaline or there is not enough aluminium then the flowers will be pink. Which is puzzling. Because apparently one of our plants is doing both. they were still a little bit wrong. It takes a very special person to bugger up a hydrangea you know. Thanks for making me laugh. I had a real giggle at that last picture. You should just say that you meant for that to happen. People will be really impressed. I know I would be! hey that is an interesting achievement - I'm impressed. Hydrangeas are pretty spectacular. One thing Hoppo Bumpo will certainly be remembered for is her ability to have people choking on their tea laughing! Hahaha. You are such a funny writer. 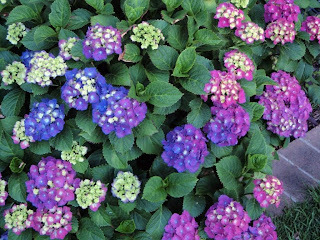 But, to your reassurance: I have a hydrangea here in the backyard that does exactly the same. It just can't seem to make up it's mind. Part of it, the proud and a bit snobby part, wants to be blue. Those branches are high up in the air, you can see them wave in the wind. But the other part, the softer, sweeter, more shy part, just wants to be purple. Even a bit pink some days. I adore your epitaph! And at least it is a living, if somewhat confused, plant. You gotta be happy with that. I would say that's a fairly common occurence among the hydrangea population. Fear not and just enjoy the beauty. Hysterical. Like a patchwork plant!!!! PS My favourite epitaph is the one Spike Milligan wanted for his tomb stone - "Told you I was ill"
P.S. I have started 2 shower caps - thanks to your tute! At least it flowered and really that is winning the battle surely. Maybe it depends where the root lands? I mean if some roots end up being on alkaline soil, while other roots are on acidic-with-aluminum soil just inches away, then that's why they have different colors even though they're in the same spot in the garden.